Plans to turn a 19th Century mill into a heritage attraction in Pembrokeshire are being reconsidered following a critical report. Bluestone, which runs a holiday village nearby, wants to create a £2.5m attraction with a narrow-gauge steam railway at Blackpool Mill. But a Pembrokeshire Coast National Park Authority report said the plans would have a "harmful impact" on the area. A decision on the plans has been put on hold at the applicant's request. Bluestone said the proposals would create 60 jobs and inject money into the local economy ever year. Bluestone Holiday Resort chief executive William McNamara criticised the park authority saying it was "closed" to the proposals and "trying to find a reason to refuse" them. He told BBC Wales the development was about "creating a future for rural west Wales without destroying the natural beauty of it". "We can't do it if our hands are tied by organisations that have no appetite for the future, it's all about preserving the past," he said. 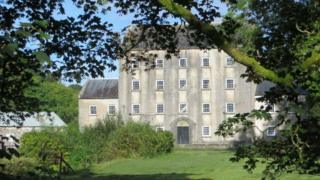 The Grade II-listed mill, which dates to 1813, survives virtually intact and includes a full working set of machinery. It was operational until World War Two. In an assessment, a planning officer described proposals to build a circular railway at the mill as "little more than the creation of a theme park attraction without any real connection to the history of the locality". Bluestone confirmed it had asked that a decision on its plans be deferred until a later date.